Unpack the clock and the enclosed loose parts carefully. Please hold the clock only on the roof — not on carvings! — (1). Please open back of clock, remove paper from spring (gong) (4) and.the both clamps from the bellows (3). Than place back of clock again. Please complete top of the carving (if necessary) (2a, 2b. 2c) and stick it up (2 to 1). 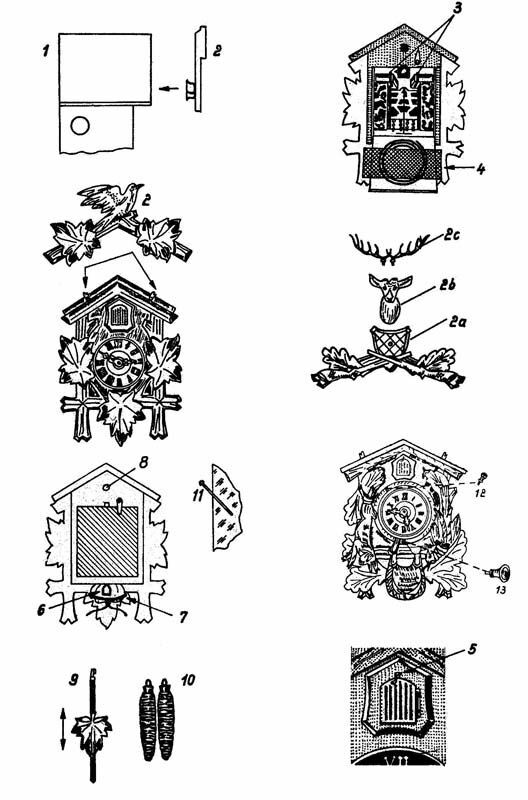 Cuckoo clocks with hunting scene: please complete bugle horn with mouthpiece (12) arid bell-mouth (13). Fix nail to the wall, about 61/2 ft. from ground or higher (8) sloping slightly and one inch sticking out (11). After hanging on the wall please open the chains on the bottom (7) of the olock and remove the wire which connect the chains. Push above the door bolt (5). Hang pendulum (9) in pendulum holder (6) and weights (10) in the hooks of the chains. This cuckoo clock has a modern rackstrike movement which is synchronising the hands with the striking work. This clock will always call and strike the correct time as shown by the hands. The minute hand may be turned in any direction. For the release of the stroke the minute hand should be moved on slowly 5 minutes before an hour. When the clock tilts forward the cuckoo may appear at add times. In this case do not push jt back because it would damage the mechanism, but move the hands on to the next stroke after which the cuckoo will disappear. The clock can be regulated by pushing the leaf of the pendulum upwards or downwards to make lt faster or slower. The chain is come out of the chain wheel if one of the weights is fall down. Ln this case please wind up the other weights and remove than these. Please remove the top carvings (2) and hold the clock on their head. Now the chain will come correct in the chain wheel. Please don‘t use any violance. Please support the weights on wind-up the clocks (to lessen the strain on the bearings).